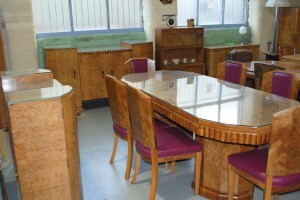 Original Art Deco Dining Room Suite, Extendable Table and 6 Chairs with optional matching Sideboard and Server. A truly exquisite original Art Deco Dining room suite. This walnut extendable table and 6 chairs have been restored and re upholstered to the highest possible standards as I’m sure you can see from the photos. 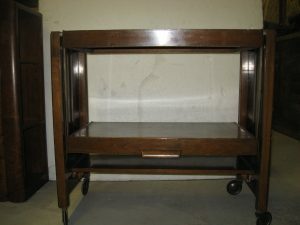 The optional matching sideboard and server also photographed are still to be restored. You can see the shape and quality of the pieces in the photographs but can you imagine the full suite finished together? Unbelievable!!! The 6 chairs have been expertly reupholstered in finest linen leather hide which compliments the walnut perfectly. 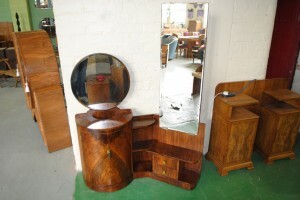 An original Art Deco Dressing Table finished in beautiful flame walnut veneers . 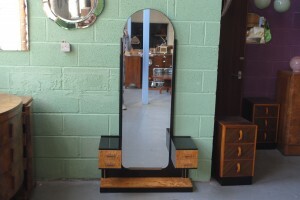 A full length mirror and a tilting circular mirror compete with a up lighter and illuminated barrel cupboard all add to the unusual shapes and design of this beautiful piece. 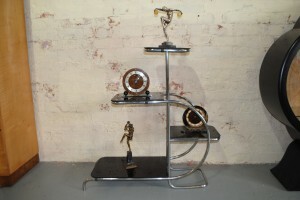 An original art deco Display stand, a very unusual shape with chrome and black glass .We have never had one like this before, great for displaying your prised art deco items or even plants. 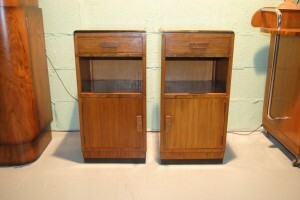 An original pair of art deco walnut bedsides. Art deco lovers please be aware of art deco cabinets currently being sold that are cheap 1950′s dressing tables cut down ! Its easy to tell as they never show a image of the inside edge. 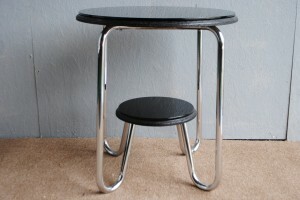 If concerned please ask for free honest advice from cloud 9 original art deco. For more information please call 01257 473688. 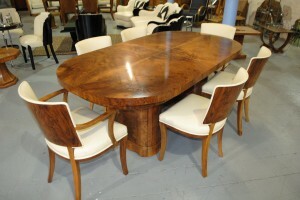 An original light walnut art deco oval dining table with 6 chairs and protective glass top. 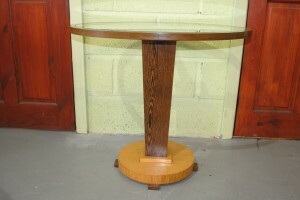 Unusual oval table top with matching oval pedestals. All in great condition.Full restoration option available. 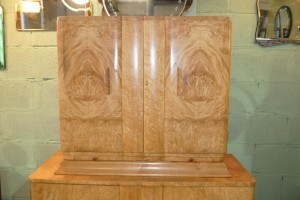 An original Burr Maple art deco cocktail cabinet. Beautiful cabinet in very good condition. Beautiful burr veneers, great mirrored interior , bottle storage and drawers and a pull out mixing tray for your favourite cocktails. This original piece has it all. 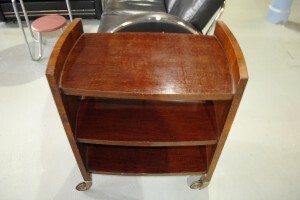 An original art deco trolley with a very nice shape. Wonderful walnut veneers to sides and edges with a lovely Bakelite finish to each drinks tray.